Mourners Honor Stephen Hawking, Whose Mind Blazed Bright : The Two-Way His mental genius and physical disability made the renowned British physicist a household name. On Wednesday, people around the world grieved Hawking's death. Everyone from NASA to the cast of The Big Bang Theory is reacting Wednesday to the death of acclaimed physicist Stephen Hawking, known for his work on understanding the nature of black holes. Hawking was the rare scientist who achieved fame in both an esoteric field and popular culture, as Wednesday's outpouring of eulogies shows. His passing was noted by actress Mia Farrow, Apple CEO Tim Cook, former President Barack Obama and U.K. Prime Minister Theresa May. “The greatest enemy of knowledge is not ignorance, it is the illusion of knowledge.” -Stephen Hawking. We will always be inspired by his life and ideas. RIP. Hawking lived with significant disabilities caused by ALS, or Lou Gehrig's disease, which required him to use wheelchairs to get around and a speech synthesizer for communication. Many remembrances focused on that aspect of his life — including near-miss wheelchair crashes. Stephen Hawking died today. I nearly killed him, and he me, 15 years ago, when his wheelchair shot out between two parked cars at Cambridge, and I was on my bike. I swerved at the last moment. 100% his fault. God bless you and RIP. But some observers objected to the notion that death had "freed" Hawking from his disease and the wheelchair. Seeing folks say that Stephen Hawking is free of his disability is gross. It is also A direct result of ableism and the media representation of disability where we should long to hate and be free of disability. Stephen Hawking *used* a wheelchair. He is the active person in the arrangement. The wheelchair helped him do things. It did not bind him. Many chose to let Hawking have the last word, simply quoting the man himself. His longtime academic home, the University of Cambridge, shared a touching video tribute narrated by Hawking. "We are deeply saddened that our beloved father passed away today. He was a great scientist and an extraordinary man whose work and legacy will live on for many years. His courage and persistence with his brilliance and humour inspired people across the world. He once said, 'It would not be much of a universe if it wasn't home to the people you love.' We will miss him forever." 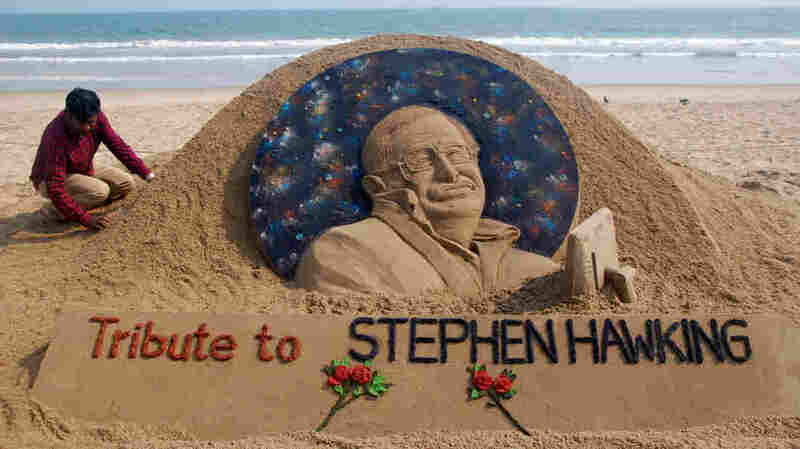 A previous version of this story misspelled sand artist Sudarsan Pattnaik's last name as Patnaik.